Rebel Diaz brothers RodStarz and G1 grew up in Chicago and came up in The South Bronx. They are the sons of political refugees from Chile who fled a CIA-funded dictatorship in the 1970s. 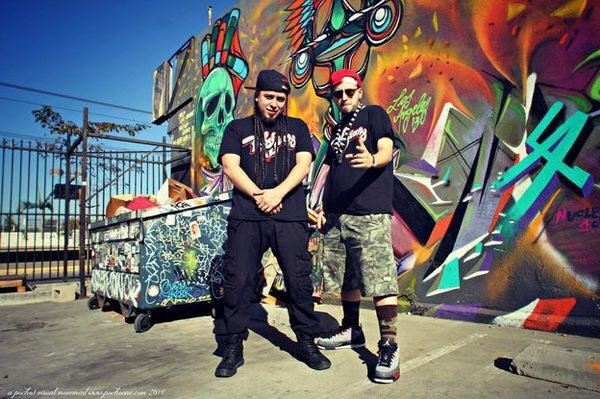 Revolution raised them, and the culture of Hip-Hop provided them their own Nueva Cancion.The brothers have been doing rebel rap since the Clinton Era, sharing their story and those of the people; el barrio, the hood, the poor, los inmigrantes. Their bilingual sound has been shaped by pieces of South American folk, house, and latin percussion gettin down with boom-bap breaks and 808s. Hip-Hop and a vision for liberation have taken Rebel Diaz around the world. With DJ Illanoiz and their band, they’ve rocked stages in front of thousands at festivals, and in front of dozens in squat house living rooms. They learned about tomas during international tours, then came back to The Bronx, took over an abandoned building and started a community center, the RDACBX. The brothers have given lectures at Ivy League schools, but are college dropouts. They went from rapping about being ‘periodistas de la esquina’ to actually hosting a television news program on Telesur English. Today, they continue in la lucha with their families and in their community through their music and multimedia work.